so said ellie: Lazing on a Sunday Afternoon. 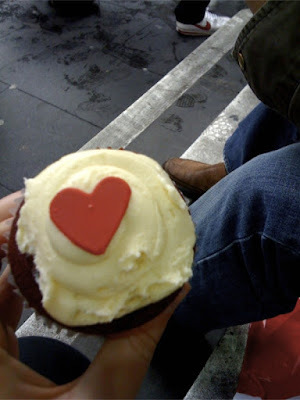 I like cupcakes mmmmmk. Food in general really. Which is why on Sunday I had the most delicious roast beef sandwich, shared a pie with peas, mash, and gravy with Rob, and ate a cupcake. Plus a little snack of burrito, and pizza for dinner. Hmmmn, that explains why I felt a bit ooky today. Too much food. Way way way too much food. Technically we were in the city to go department store shopping, but it didn't really happen. Just a lot of semi-aimless wandering through David Jones and a momentary lapse of sanity while I fingered a KitchenAid Mixmaster Artisan. I bought a super fantastic cute notebook with little birds on it too. Because I really needed a super fantastic cute notebook with little birds on it. Definitely. 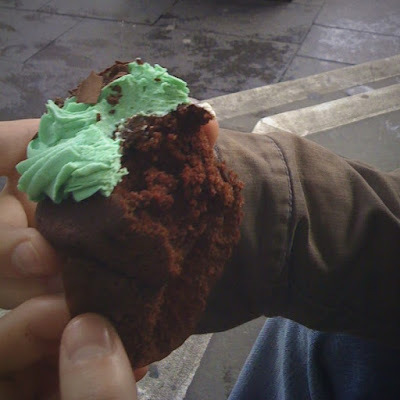 But I can't lie to you, really, when I put two and two together and realised we'd be near the QVB I knew I would have to hunt down a cupcake from The Cupcake Bakery. I'd been thinking about those cupcakes ever since a friend and I tried, multiple times, to catch up there. 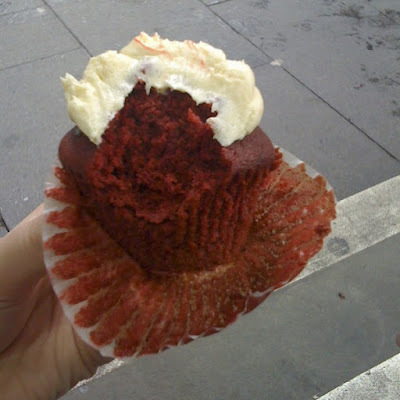 Since I don't go into the city that often, the place had become a cupcake enigma in my mind. Never mind the crap photos and incredibly photogenic background scenery. The weather was vile so we sat down on a dirty step near Town Hall to eat and wait it out. I had red velvet. Got sucked in by the little red sugar heart on top. Rob had a (horrid looking) choc-peppermint.